Dealing With A Broken Spring? Our Repair Team Have Got You Covered! Garage door springs are an essential part of any automated or manual door system. These components perform two main difficult tasks. The first is keeping your heavy door aligned and secured so that it can be used safely by you and your family. The second task is actually pulling the door's full weight, which allows you to easily lift it manually, or to automate the process using an opener. They are not invulnerable, however. Far from it. Springs require timely replacement when they're about to reach the end of their lifespan, or when they become damaged by various other factors. Since the nature of the action of these components is to operate under continual stress, they are liable to accumulate wear and tear damage over time, which will eventually cause them to break. Springs use either a stretching and contracting action or a twisting and unwinding motion, depending on their type, in order to leverage the weight of your door. It's from these repeated actions that they eventually succumb to stress damages such as cracks and distortions, which also serve as warning signs that failure is imminent, meaning your springs need to be replaced as soon as possible. Rust caused by consistently damp weather, or galvanic corrosion which is caused by these components coming into contact with electrified metals, can each do a staggering amount of damage to your springs, which will weaken their structure. will severely undermine their performance capability and could lead them to fail unexpectedly. 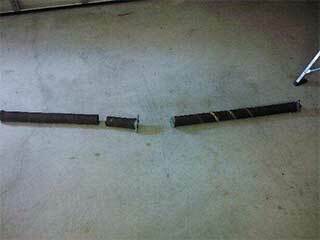 The urge to go the DIY route when a garage door spring breaks can be tempting, but it is highly inadvisable that you take matters into your own hands when faced with such a scenario. Springs carry a lot of tension, and so when they snap that tension gets released and could essentially turn it into a projectile which can cause property damage or physical injury. For this reason, it is always better to have an experienced technician conduct the replacement work for you. Our experts at Garage Door Repair Irvine will happily do this for you. Contact us today for additional information.